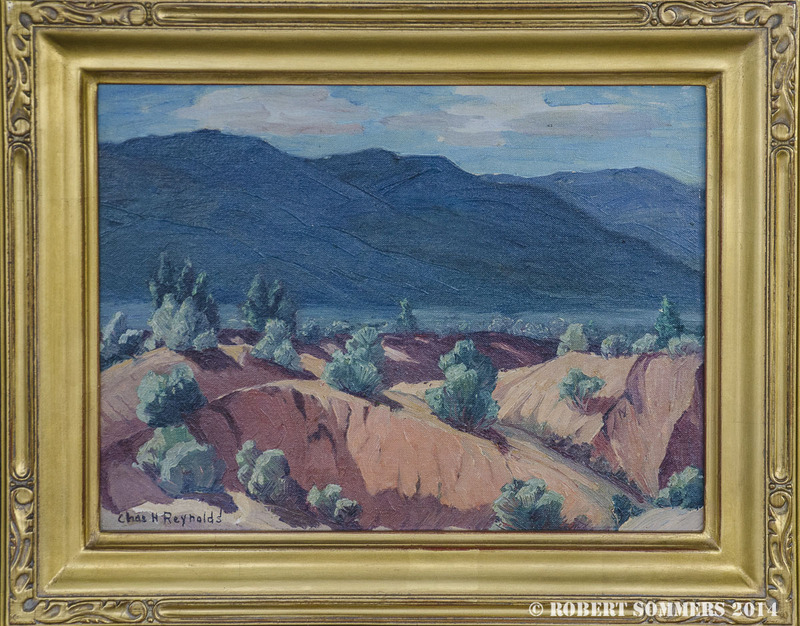 A Taos, New Mexico artist, Charles Reynolds was born in Kiowa, Indian Territory (now Oklahoma) in 1902. He attended both Oklahoma and Tulsa University, and it was the latter that he met and married Ruth Weaver. The Reynolds have three children and eight grandchildren. The artist began painting in 1925, and except for a short period at the Chicago Art Institute and a brief study with John Elliot Jenkins, he is self-taught. The Reynolds family discovered Taos in 1932, and after fourteen years of vacationing there, they moved out permanently.” I wanted to live there and associate with the ‘Taos Greats’ said Reynolds. To him it was a great inspiration to live and paint with the men who founded the Taos Colony and saw it successfully launched. Reynolds is a confirmed Realist. He is a fine technician and craftsman, as his paintings show; but he is equally adept as a salesman and promoter of Art. He sells a great volume of artwork in his establishment, both his own and that of others. His gallery is perhaps the largest Commercial Art Mart in the State of New Mexico.